Dolls, in the left corner you will find Alexander McQueen’s ultra-fabulous Fuchsia Suede Ankle Boot; in the right corner, prepare to swoon over Steven by Steve Madden’s mesmerizing Macki Bootie in Fuchsia Suede. Though the Madden marvels sport a slightly lower shaft than that seen on the magnificent McQueen’s; for a mere $198.95, as opposed to the $1,075.00 needed to add a splash of the celebrity-adored McQueen to your shoe collection, they are every bit as capable as their couture cousin of commanding attention at the drop of a hat – without, luckily for you, leaving one penniless! Thanks to Alexander McQueen and Nordstrom for the pictures. Alexander McQueen to the rescue! Love this color! So gorgeous. So glad you found the Alexander McQueen! What a great find! Wow, so much alike too. Absolutely, adore the Alexander McQueen! Oh, Hot Pink! So glad I saw them today. Definitely Alexander McQueen, all the way. So cute, loving the color! i can think of a million things id wear these with!!! They're so lovely. I definitely need more bright heels. Love the color of these ankle boots! 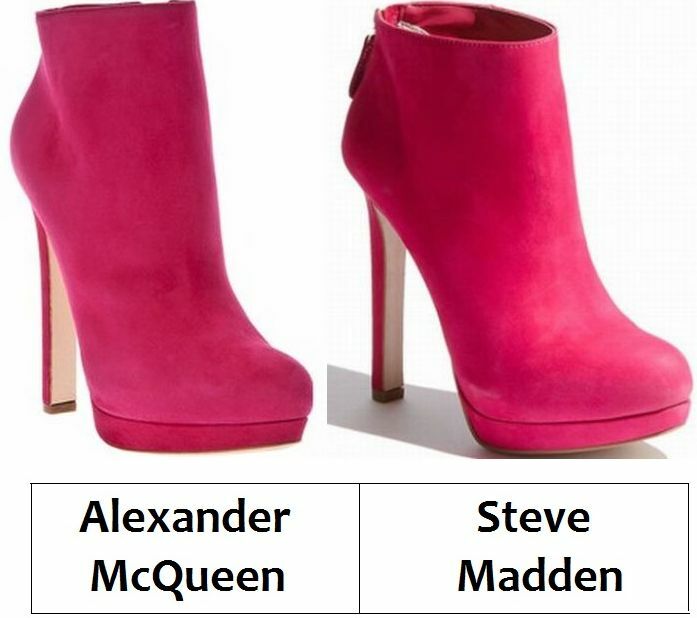 I do prefer the McQueen ones because of the ankle part but would never be able to afford them. The Steve Madden is a great identical pair! woah, they're practically twins. you can hardly tell the difference. i think i could go for the cheaper one. but then again, the alexander mcqueen is probably of better quality. but steve madden shoes are amazing! GORGEOUS color. I loveee fuscia! Not my style, but quite a match on Steve Madden's part! These are so pretty! I'm so happy they look so much alike, too. They are gorgeous!I love them! Everyone needs a little Alexander McQueen in their lives! I love both pairs. They really resemble each other. That color is GORGEOUS. On such a fun piece, I'd DEFINITELY go with the Steve Maddens. I've seen this color a lot lately. And the more the merrier! love the designs. great selections, Erika! Fuchsia + suede just sound so fabulous together! Wow, I never thought I'd be a hot pink booties type of girl, but I suddenly feel like I NEED a pair of these! Would it be considered fashion blasphemy if I said I liked the Maddens better??? I feel this way solely due to the shorter ankle shaft. We short girls need to retain as much leg length as possible! The McQueen is a genius shoe though in an amazing color--my favorite color--and definitely a good budget version in the Madden.